PDF File Email Extractor v2.0.2 software allows users to select PDF Files one by one or All PDF Files from folder to extract email addresses. PDF File Email Extractor v2.0.2 software have options for filter extracted email addresses, so you would get only email address list that you want, not all available emails in PDF Files. PDF File Email Extractor v2.0.2 allow you to save extracted email address in various file formats as COMMA SEPARATED (.CSV), New Line Delimited & TAB Delimited can be open in NOTEPAD. 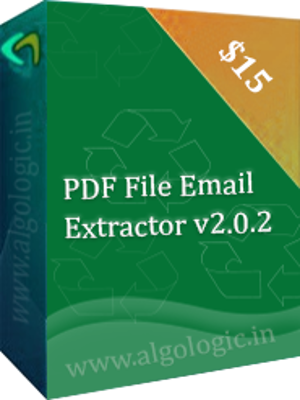 PDF File Email Extractor v2.0.2 extract all email address from PDF Files in batch process. Allows you to extract email address from All Or selected PDF Files of any version. All Available Filters helps you to exports only email address you want in emails list. PDF File Email Extractor v2.0.2 not required other software to process pdf files. PDF File Email Extractor v2.0.2 is best email software to have emails backup from PDF Files. Easy, Simple & user Friendly GUI.